di Bocconi Students Investment Club 7 Ottobre 2016 5 min. The past summer has been quite hot: we saw unexpected Brexit, Turkish failed coup, the presidential campaign in the US is on the peak, and EMs are bursting out of inflows. On the backdrop of all these events, one very interesting trend may have left out of the scope of attention: the USD LIBOR has significantly increased: 3-month rate stood at around 0.6% at the beginning of 2016, while it has reached almost 0.86% as of the end of September. That is the matter we are willing to get into in this article: we will try to analyze four potential reasons for this trend. As the name of the article suggests, we would consider two recent pieces of regulation: one considering LIBOR rate calculation, another dealing with money market funds. The article is followed by a brief conclusion, which is aimed to recap our key findings and considerations. Though let’s start with some history and theory. Chart 1. 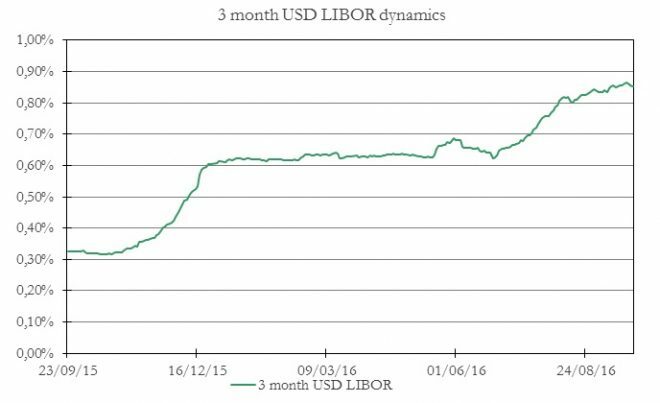 3 month USD LIBOR is on the rise. Chart 2. 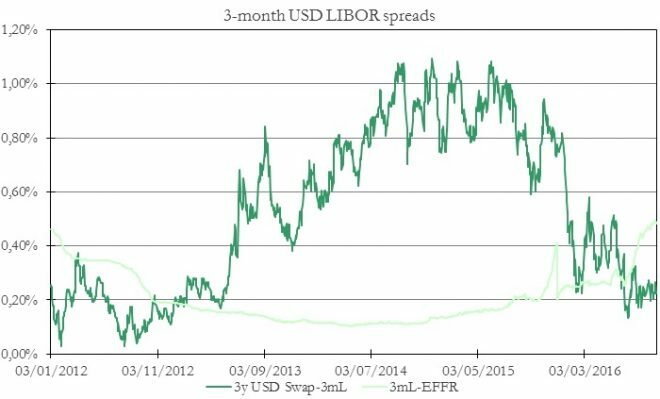 3 month LIBOR spreads over 3yr USD swap stands close to 4 year lows, while spread over EFFR has breached 4 year highs. LIBOR represents the average rate at which a panel of major banks (from 11 to 17, including JPMorgan Chase, The Royal Bank of Scotland, Bank of America, Citibank, Barclays, etc.) can obtain loans in the London interbank market for 5 currencies (USD, EUR, GBP, JPY, CHF) and maturities from overnight to 12 months. The banks were daily asked the following: “At what rate could you borrow funds, were you to do so by asking for and then accepting interbank offers in a reasonable market size just prior to 11 am London time?”. LIBOR was then calculated as the trimmed arithmetic mean of the submitted rates after that the top and bottom quartile had been excluded, which means that the top 25% and the bottom 25% figures are not considered in the calculation to avoid outliers. Because the benchmark had to be published daily even if there have not been transactions in each currency and maturity, it was based on estimates rather than actual transactions. 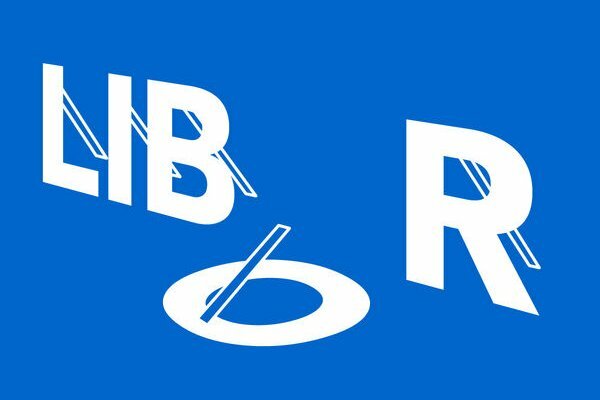 A major change in the way LIBOR was defined and calculated happened in 1998 when the British Bankers’ Association (BBA) switched from a rate at which the submitter believed a prime bank would have been offered deposits in the market to a rate at which the panel bank itself could borrow funds. Barclays Bank was fined for £59.5 million by the Financial Services Authority (FSA) for failings related to the LIBOR and EURIBOR and for $360 million by US authorities for tampering and false reporting of the EURIBOR and LIBOR during 2005 to 2009). In June 2012, the key points of the incoming reform were introduced. The main arguments were a statutory regulation of the administration of, and submission to, LIBOR and the transfer of responsibility for LIBOR administration from the BBA to a new independent administrator. Since February 2014, the Intercontinental Exchange Benchmark Administration (IBA) has administered the benchmark rate under the name ICE LIBOR.